Are plastic sheds any good? regarded the big question rolling around our minds for a few years prior to taking the plunge and opting to purchase. Finding a solution to break-free from upkeep duties was our incentive after years of frustrations in relation to decay maintenance. A resin composition delivers the resolution in eliminating conservation headaches boasting immunity from rust & rot. Weather depreciation is a dilemma wood and metal constructions are quite susceptible to, leading to their structural demise. On the contrary, the constitution of resin delivers long-term subsistence to weather stresses without any alteration to their structural format. After suffering the burden of replacing roofing felt for the umpteenth time, our last trauma occurred after a winter’s snowfall. After losing a fair amount of stock due to storage becoming drenched in addition to the establishment of rot setting into the floor’s structure, it was time to make a change. 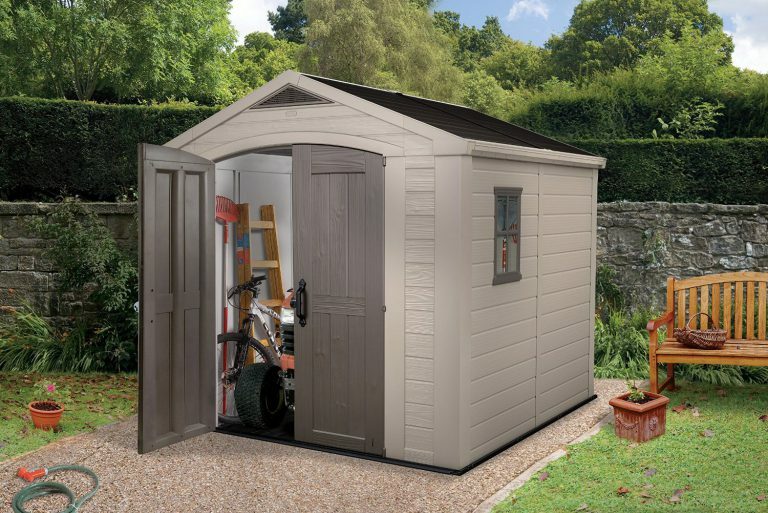 Probably the best garden sheds on the market relate to pressure treated cedar wood topped off with a resin roof, check those prices out – Ouch! We searched for something durable & affordable. We inspected both the metal & plastic varieties. Personally for us, we decided against metal due to friends expressing their thoughts. Although a steel structure assures higher security, their flimsy metal shell soon becomes dented, the doors are usually the sliding design restricting access somewhat, they have a tendency to sweat when the weather’s humid and rarely contain integrated floors. Plastic compositions on the other hand do vary in build quality, dependant on whether a single or dual-walled skin constructs their make-up however this has a tendency to fluctuate prices. Although every shed should be anchored down, single skinned structures are very lightweight and can be rather flimsy yet costs are a lot less. Keter’s polypropylene or Lifetime’s polyethylene multi-layered facades and Suncast’s blow molded technology for instance increase their sheds overall weight, delivering enhanced robustness to their construction. These heavy-duty sheds however demand a heftier price. Although a tad more expensive, we decided on a double walled skin. A heavier weight enhanced stability reassurance for us, delivering contentment for our purchase. 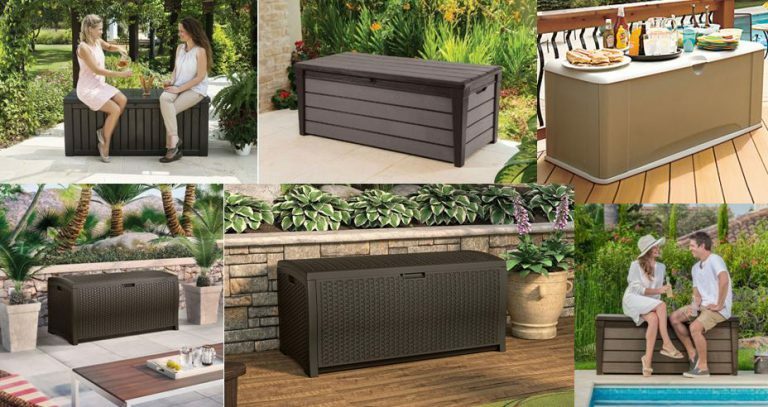 Rest assured, whether polypropylene or polyethylene regards your chosen composition, these are recyclable environmentally friendly materials that do not contaminate the ground with harmful toxins, unlike many paints, stains and varnishes used to preserve wooden structures. These types of resin surfaces deliver plain-sailing with regards to cleaning, their only maintenance is trouble-free. A light pressure-wash or spray-hose down revitalises their appearance in rapid time whilst scrubbing with a softish brush, warm water & detergent regards the duty to remove embedded grime. The first ranges of resin sheds to enter the market displayed cheesy glossy looking impressions, shouting plastic from a distance however evolving through recent developments, manufacturing procedures deliver superior weather-resistant mixes whilst new cutting-edge designs produce innovative molding techniques in the way plastic is shaped & exhibited. There’s some ultra classy appearances being introduced, prioritising low-maintenance at the forefront of their design. Initially we were rather daunted at the prospect of erecting our own garden shed due to the sheer size of the project. The resin variety arrive flat-packed requiring self assembly with instructions warning to prepare a levelled base of wood, concrete or paving slabs before you get rolling. 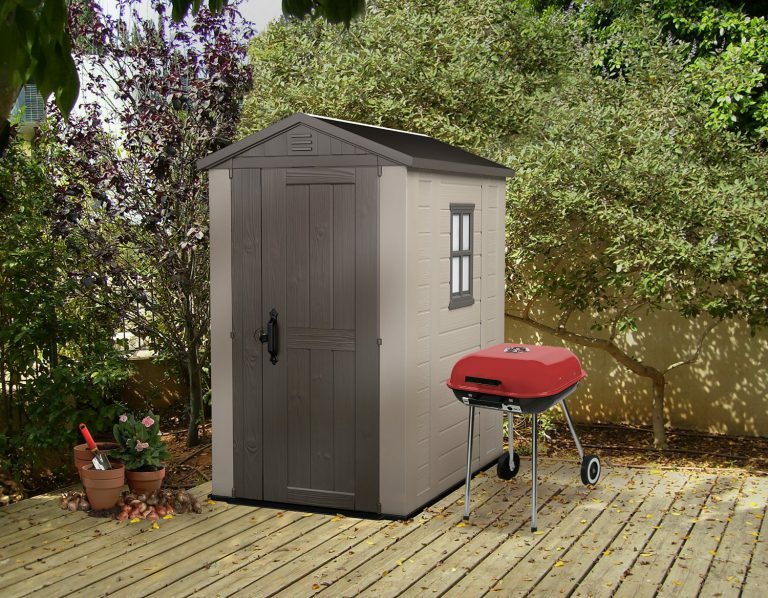 I think the intimidating construction process regards the reason for the sudden upsurge in demand of the low-profile mini sheds, many opt for additional sheds in this design whilst others combine deck-box storage to organise their outdoor gear due to their simplistic ease of assembly; construction’s a cinch upon comparison, Suncast even include the assembly tool. I have noticed a plastic shed Assembly Service for Lifetime sheds over in the UK, this is a great idea. I’m guessing Installation Services will cover a whole variety of resin sheds in the near term future to aid those discouraged by the DIY process. To be honest, we found the entire construction procedure pretty straightforward, assembly’s a matter of implementing the illustrated steps demonstrated within the instructions however their foundation rule is pivotal & something we adhered to, helping us to accomplish a flawless build. 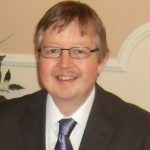 Reading through feedback I can usually determine whether people have adhered to the foundation stipulations, failing to take their importance on-board can be detrimental to the outcome. Prior to our purchase, we read dozens of reviews beforehand however it occurred to us that as long as the correct foundations are in situ, you’re pretty much rolling, this is crucial in accomplishing a flawless construction plus assembly’s quick, as the panels plumb alignment constructs like a dream from a levelled base. Accompanying the benefits regarding constructing from levelled footings delivers a right-angled upstanding shed ensuring tension isn’t exaggerated to one side plus the doors’ operation from vertical architraves delivers a faultless swing, performing their sweet opening and closure. Solidity below assures the entrenchment of the shed’s sturdy anchorage enabling securing screws down into firm groundings whilst also making certain the base is level & flat presents the correct surface for the resin floor to subsist enduring hefty storage stresses. I find it a pity for such a large investment, sales sites rarely mention the foundation principles, leaving purchasers unaware until reading the assembly instructions. Many side-step this measure due to time constraints however this represents a huge mistake, an exemplary shed construction can only be derived from preparing the correct substrate for the shed to stand on. Another huge tip relates to not having a shed stood in a flood, it’s advisable to raise the foundations above the level of a floodplain to prevent this occurrence. 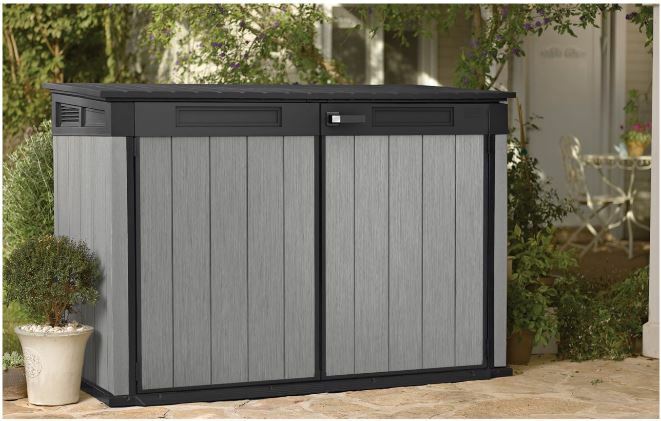 Similar to their wood & metal counterparts, plastic sheds are designed weatherproof, not waterproof. Resin delivers an impervious composition, granted; however their interlocking mechanisms contain tiny gaps, these will leak if fully immersed. Initial worries whether a plastic composition would stand up to the strains of adverse weather forced upon them soon disappeared upon thoughts of how wheelie trash bins endure the stresses being roughly banged about like crazy during refuse disposal days. Do you remember the old rusty metal dustbins with the bottoms collapsing out? Me too. 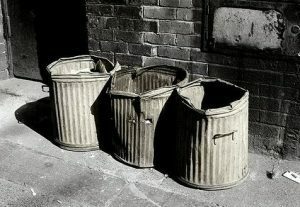 What a nightmare those were to empty yet plastic rubbish bins survive the pressures and withstand decay. 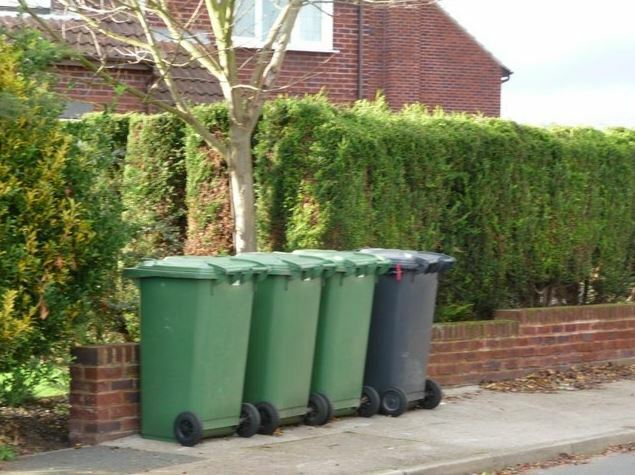 I have to admit, I was one of those people who said resin bins will never survive the pressures of waste collection days and harsh weather environments long-term. Look where we are now. Our thoughts also swayed towards the way many modern car trims are now designed, where resin is stylishly molded around the car’s base and parts which are commonly subject to knocks. Okay they look super slick & sporty however appearances remain that way no matter what the weather throws, specifically designed to prevent rust deterioration. Metal only needs a few knocks before rust starts to embed. 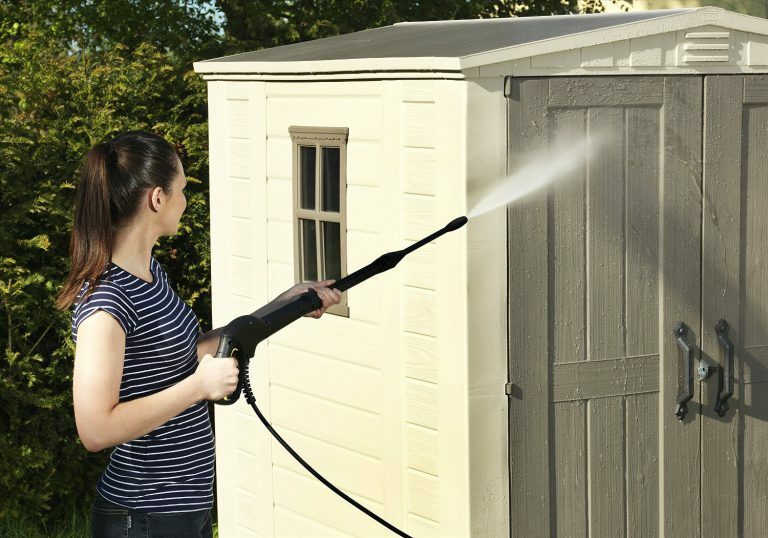 Back to sheds, resin subsists the stresses inclement weather throws whilst the quality dual-walled skin varieties such as Keter, Lifetime, Suncast & Rubbermaid etc, are designed more robust, withstanding dents, chips, peeling, rust, rot and decay. These were a few of our initial thoughts regarding the positives of resin but are their constructions sturdy enough to stand up to wild windy weather conditions? Who really thought Resin would be strong enough for refuse waste? I can’t comment on the single skinned plastic sheds due to not being fully acquainted with their constructed design. Quality chunky walled facades to which this website reviews however do require securing to a sturdy steel framework due to their heftier weight, same principles apply to their roof design yet this does further enhance stability. Anchoring the shed down onto the solid ground below delivers a firm fix, increasing wind resistance levels to survive adverse weather conditions. As the lengths of sheds increase in size throughout their ranges, additional steel beams are introduced to span their internal apex widths under-girding the roof structure with reinforced support, the larger the length, more steel trusses are added, usually every 2.5 – 3 feet to coincide with the additional roof extension kit. Usually, skylights are inserted into the roof’s apex ridge accompanying the windows to bask the interiors with daylight. Their poly-carbonate or perspex manufacture puts an end to smashed windows delivering a user-friendly feature, significantly important when embedded into the roof structure for a shed positioned under a tree. 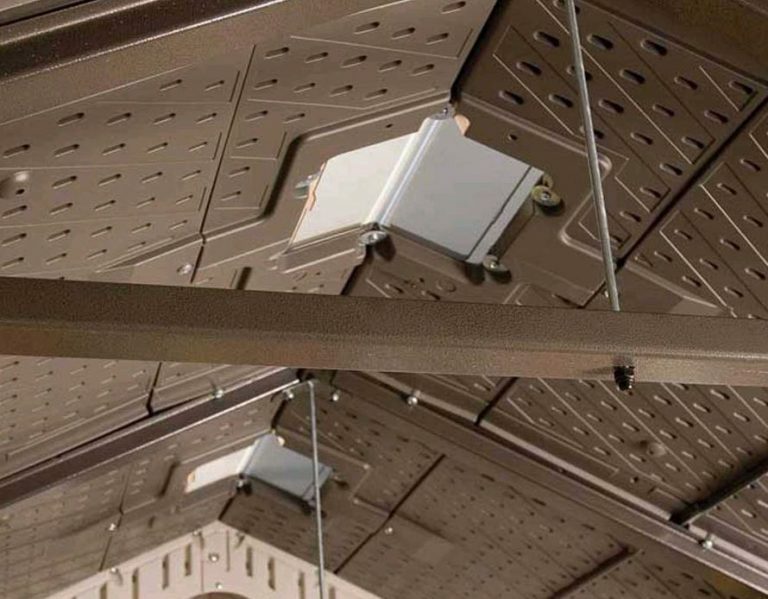 Air vents are now built into resin designed sheds, situated front and back they effectuate a fresh-aired distribution system preventing moisture building up in humid weather and a sweaty internal atmosphere evolving, replaced with a fresh preserved ambience. Built-in floors help control a clean internal space delivering a blockage for wafts of outside debris blowing through at the base and the arise of rainwater puddles developing on the shed floor. Quite a pleasant internal environment is sustained through the combination of air-vents with an integrated floor. Hinge operated doors provide A 1 access as opposed to the sliding alternatives however just like a house door, it’s imperative not to let them swing open in wild weather. Most quality plastic facilities have internal latches fitted at the top & bottom of their left hand doors which slide into grooves enabling that door to be kept permanently closed. Although all door designs vary in style, their handles contain security clasps for fitting a padlock to facilitate locking. In our view, a quality resin shed has been the best thing we introduced into our garden to serve outside storage. 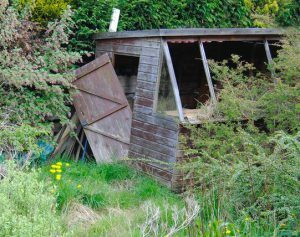 It’s been such low-maintenance compared with the dilemmas our last wooden hut put us through, time spent replacing roofing felt, rotting wood issues and yearly re-coats of preservative varnish which never seem to live up to the tin’s description. Hassles replaced by an effortless shower down once in a while during the summer months. Prices of quality constructed plastic sheds do fluctuate yet start off with the most competitive of prices regarding Keter’s Factor range which have achieved best selling status worldwide. 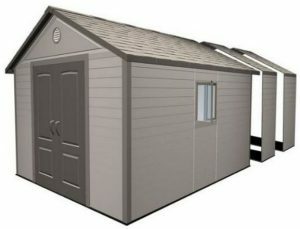 The image below displays the 4 ft x 6 ft shed, hugely popular & affordable. If you have any resin shed queries, please share in the comment box below. Always pleased to help. Please share the advantages of plastic sheds with your social friends. Thank you! Thank you for your site. It is so informative regarding sheds, other products vs. resin. 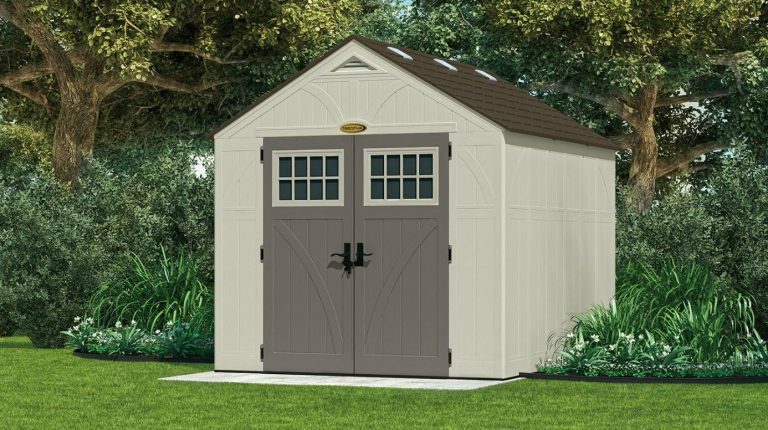 I am in the process of reviewing sheds to purchase to get the items not needed in my garage like lawnmower and making room in the space for the another car. This site was very helpful information to direct me in what to purchase and what to look for in a shed. Thank you so much for your knowledge. Thanks for your interest in plastic as opposed to wood and metal shed constructions. This website built around my passion to be honest, we searched for an alternative to wood after hassles with roofing felt and a rotten floor not to forget the yearly battles with re-coats of varnish. We thought we’d take the plunge and try a plastic construction like this article describes, we made a time saving decision, that’s for sure and very happy with the outcome, I’d though I’d share with visitors. 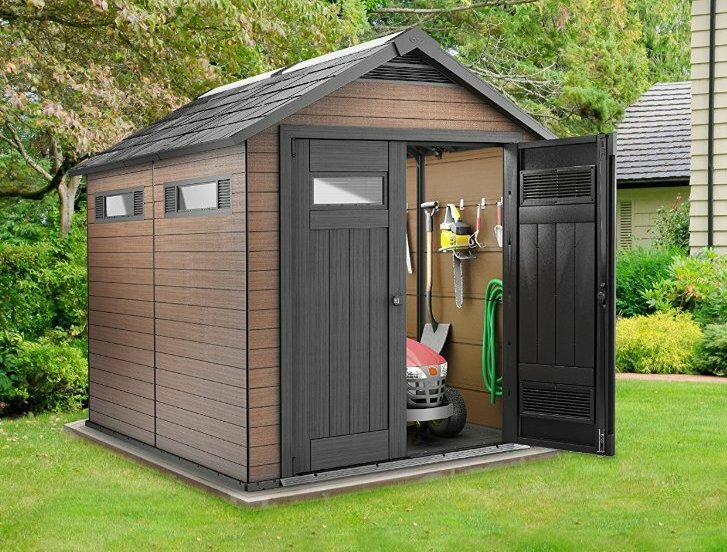 If you’ve had you garage full of gardening equipment and the likes for quite some time, the difference a shed makes once you clear the space is superb & like you say, enough room to park your car, they really do provide a service for outdoor storage accommodation. Hope this website helps make an informed shed decision. 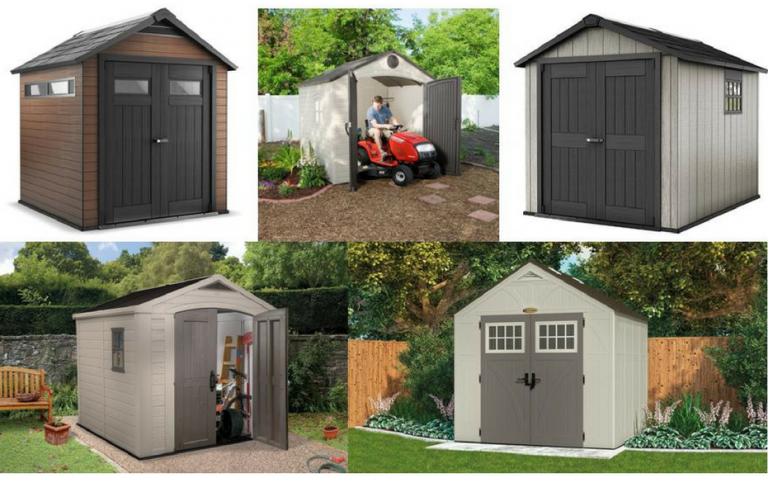 The Factor range of sheds is a good place to start as they are world renowned, extremely competitive and receive very good feedback plus I have created a page called Shed Sizes, where sheds work their way up in size order with links to reviews.